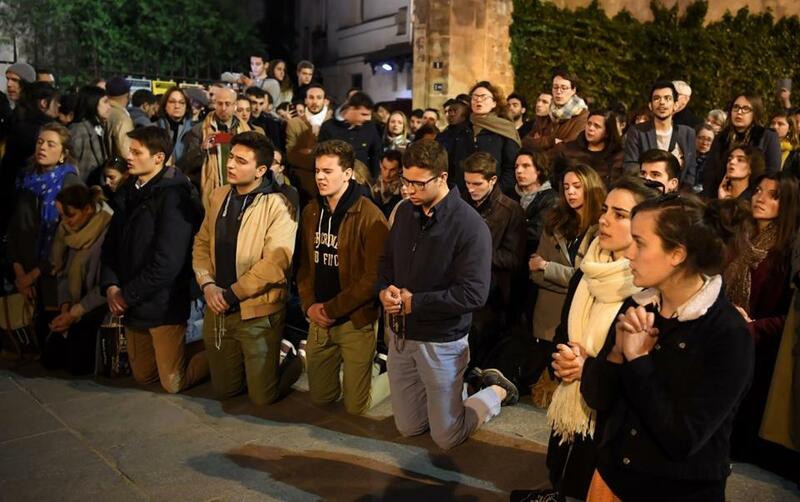 People kneeled on the pavement as they prayed while watching flames engulf the Notre-Dame Cathedral in Paris on Monday. The world reacted with shock, horror, and prayers to the massive fire at the Notre Dame Cathedral in Paris. President Trump said the cathedral ‘‘might be greater than almost any museum in the world and it’s burning, very badly.’’ He said the fire, which dominated news coverage, was a terrible sight to behold. Cardinal Timothy Dolan, the archbishop of New York, said he prayed at his city’s St. Patrick’s Cathedral for intercession.